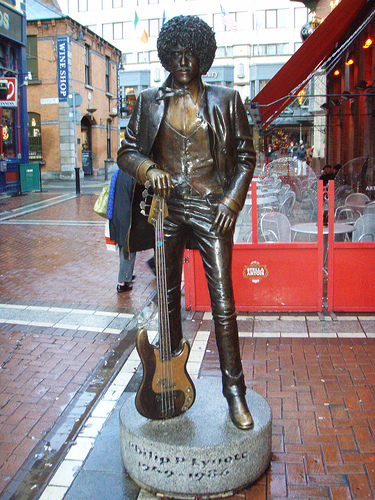 Some b*stards in Dublin have gone and knocked over the statue of icon Thin Lizzy frontman, Phil Lynott. Apparently they were in ‘high spirits’ according to Phil’s mum, Philomena and they meant no harm. I have deleted the original comments I wrote about them as the anger has cooled down. Estimates are that the statue will be back on Harry Street in one week. Gardaí are appealing for witnesses who may have seen the incident. If you saw anything – please call your local Garda station and report anything you might have seen on Harry street at that time. A picture of the damage can be seen at Hotpress.com. This entry was posted on May 10, 2013 at 5:00 pm and is filed under Music, News with tags Damaged, Phil Lynott, Phil Lynott Statue Damaged Overnight. You can follow any responses to this entry through the RSS 2.0 feed. You can leave a response, or trackback from your own site.